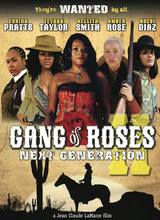 Sequel to Gang of Roses (2003). La Marre: "Upon the release of the original film, we were presently surprised at the popularity of the film. We moved about 250,000 units in the first two months of its DVD release. At the time, we had a fairly robust DVD market. Subsequently we sold the film to BET in its first TV window and it because a huge ratings smash for them. So much so, they re-licensed the film once their TV window expired. TVOne then purchased the next window, and again the ratings were huge for them. It became evident that if all the elements were aligned and everything worked out, it would be a good business and a good creative decision to move forward with a sequel. We were looking for folks who were popular and known in the hip hop community. We got the cast we got and were able to secure financing and did a sequel."